Dr. Jessica Klusek has received an Early Career R21 Award from the National Institute on Deafness and Other Communication Disorders. Dr. Klusek spent three years in the NDD Lab for a postdoctoral fellowship before joining the USC Communication Sciences and Disorders department as an assistant professor in 2016. Her research focuses on communication disorders associated with autism and fragile X syndrome. She will use the three-year, $440K grant to advance her research on the FMR1 premutation, aiming to delineate the full range of oral and written language features associated with the FMR1 premutation as well as their interface with cognitive-executive aspects of the phenotype and FMR1 gene dysfunction. This will be the first systematic investigation of language abilities in premutation carrier mothers—examining aspects of written and oral language that differ from non-carrier mothers and mothers who have children with autism spectrum disorder. If you’re interested in participating in Dr. Klusek’s study, you can learn more at http://www.scfamilystudy.com. 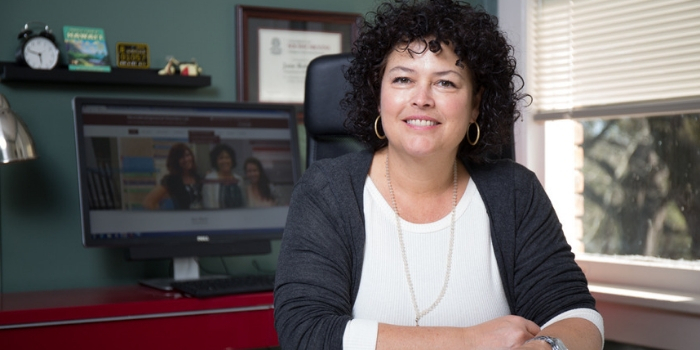 Dr. Jane Roberts and the Neurodevelopmental Disorders Lab at the University of South Carolina are pleased to announce the availability of one full-time NIH-funded postdoctoral fellowship position. The fellow will have the opportunity to participate in a variety of ongoing projects focused on early development in fragile X syndrome, autism, Down syndrome, and siblings of children with autism. The fellow will be encouraged to submit their own application for external funding to a major federal agency or private foundation. 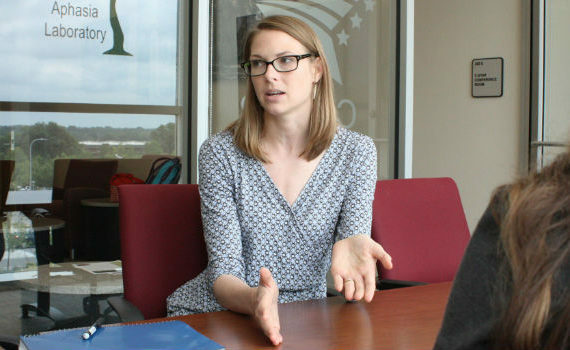 Dr. Roberts’ postdoctoral fellows have a history of external funding success, particularly with NIH F32 and Loan Repayment Program (LRP) applications. Applicants with expertise in neurodevelopmental disorders will be considered. 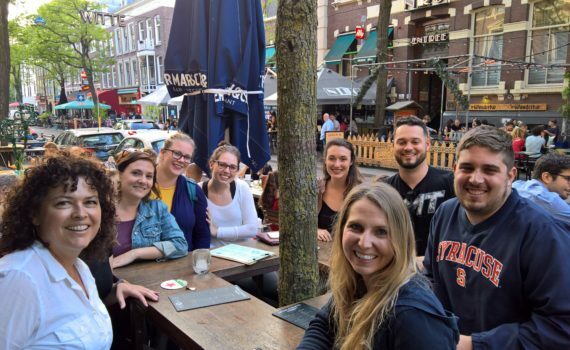 Our group is multi-disciplinary and includes faculty, staff, and students with training in Communication Sciences and Disorders as well as Clinical, School, and Developmental Psychology. While this fellowship has a primary focus on research, there will be many clinical training opportunities, and clinical supervision can be provided by our team’s licensed child psychologist. The start date is Fall 2019, with some flexibility as needed. This is a two-year position, with possibility of extension. For more information, visit uscdevlab.com. 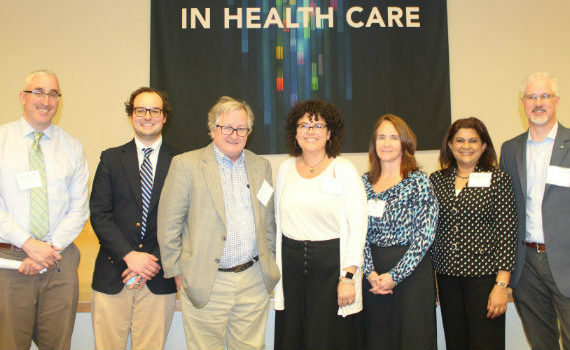 Several members of the NDD Lab recently presented at the South Carolina Autism and Neurodevelopmental Disorders (SCAND) Symposium at the Medical University of South Carolina (MUSC) in Charleston, SC. The SCAND Consortium is a network of scientists in various fields who are united by their mission to understand neurodevelopmental disorders and to provide support for families affected by this disorder throughout the state of South Carolina. We rang in the new year by welcoming three new research specialists to our assessment team! Kayla Jarvis and Nichole Mayberry joined the lab in January as full-time research specialists. Libby Tillman began volunteering in the lab as an undergraduate assistant in 2018, and is transitioning to her new role as a part-time research specialist while she completes her bachelors degree here at the University of South Carolina. We also want to take a moment to congratulate Dr. Abby Hogan on her promotion to Associate Director of the NDD Lab! Dr. Hogan joined the lab in 2015 as a postdoctoral fellow. In addition to her new role, Dr. Hogan is a Research Assistant Professor in the USC Department of Psychology. Many of our families know Carly Moser, who worked in the NDD Lab as a Research Assistant from 2016-2018. 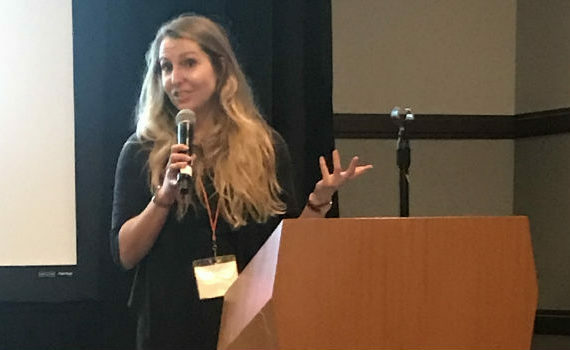 In 2019, Carly embarked upon her doctoral training in Communication Sciences and Disorders at the USC Arnold School of Public Health under the direction of one of our collaborators and former postdoctoral fellow, Dr. Jessica Klusek. Two of our PhD students recently moved on to internships! Kelly Caravella White is currently completing an internship at the Carolina Institute for Developmental Disabilities in the Department of Psychiatry at the University of North Carolina Chapel Hill. 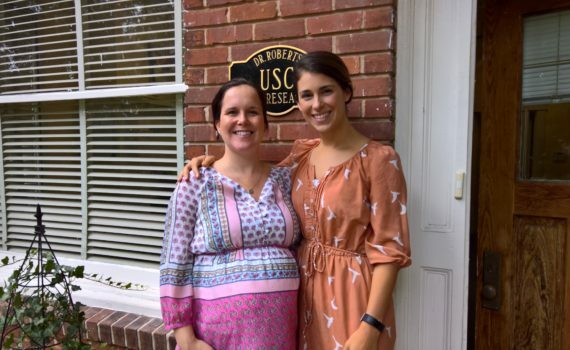 Sara Matherly is currently completing an internship at Blythewood High School and North Springs Elementary School, as well as with Developmental Pediatrics at USC Medical School and Palmetto Richland Hospital here in Columbia, SC. 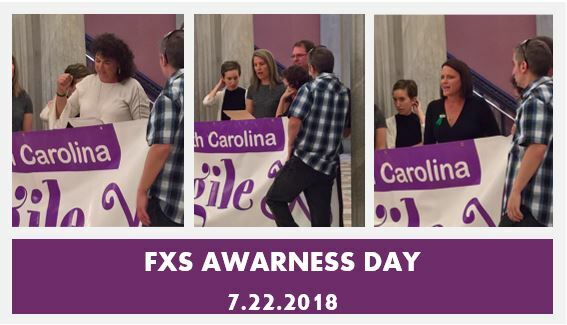 In the heart of South Carolina’s capitol, Dr. Jane Roberts, Dr. Jessica Klusek, Robin Blackwood, and the Kuperman family shared their personal experiences with Fragile X syndrome in honor of the proclamation of July 22, 2018 as Fragile X Awareness Day. Thank you to everyone who came out to the State House to celebrate this declaration and to everyone who has played a role in raising awareness, advocating for policy, and fostering a welcoming community! 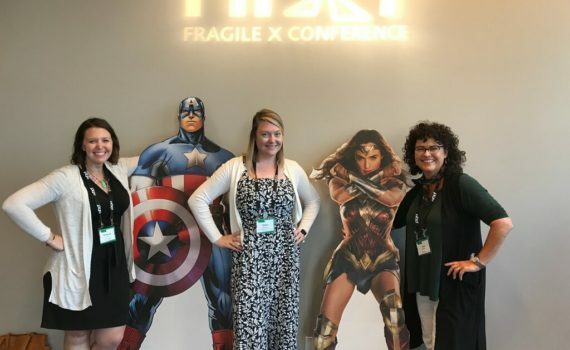 Superheroines of Fragile X Research! 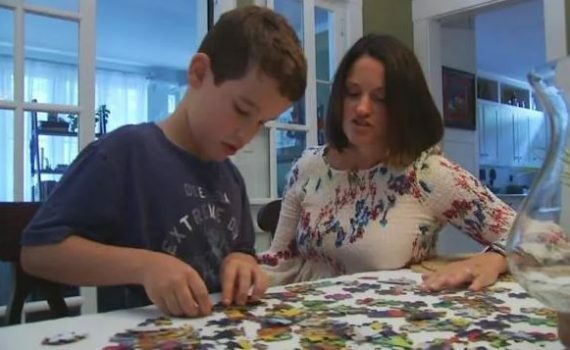 Although the genetic underpinnings of fragile X syndrome are known by scientists, it often goes undetected due to lack of awareness among the public and sometimes in the medical community. 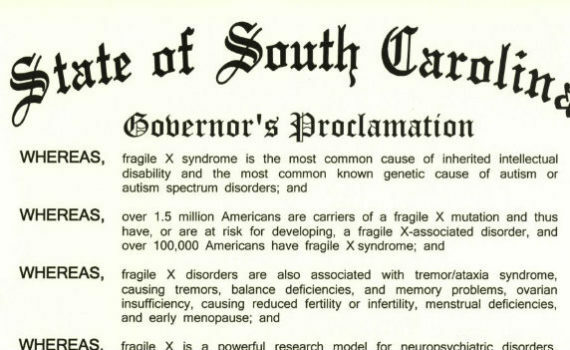 We are proud of South Carolina for increasing efforts to raise awareness about this condition, with the aim of helping patients with the fragile X gene make better-informed decisions and encouraging all South Carolinians to fight for early diagnosis and treatment of this disorder. Governor Henry McMaster proclaimed July 22nd, 2018 at Fragile X Awareness Day in South Carolina. In honor of this occasion, Dr. Roberts will be speaking at the SC State House Lobby in Columbia on Monday, July 23rd at 11:00AM. Please consider coming out to the State House to commemorate this special occasion! Local community leader, Robin Blackwood, headed to Washington, D.C. to share the story of her son Sam, who was diagnosed with fragile X syndrome, with legislators. Blackwood joined parents from around the nation as part of the 14th annual Speak Now for Kids Family Advocacy Day. Blackwood advocated for children’s health, particularly to safeguard care for children with special needs. Thanks for bringing awareness to such an important issue! Read more about her efforts at Greenville Online and Fox Carolina.